We are proudly offering services of forklift for sales & rental for our customers. After years of experience in the field of forklifts and logistics we have acknowledged each business has his own characteristics which define his needs. In the continuous conflict of forklift for sales & rentals we have found our answer. Both answers are correct; for some businesses it would be more cost effective to purchase a forklift while on the other hand, businesses will chose to rent a forklift. Forklift for sales & rental, how do you make a decision? Sometimes the answer is very clear, if you are in need of forklift on a daily base for many hours of work, it would probably be more cost effective to purchase a forklift for your business. 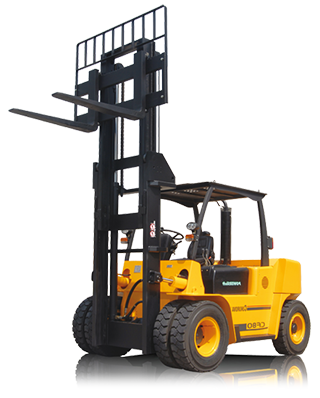 As well you can take it to the opposite, if you rarely need a forklift and use it only in some special occasions so you should prefer rental service. The conflict of forklift for sales & rental becomes to be more difficult to answer on the gray area, where your needs are in the middle. To answer this question you need to bring into consideration all the details. We will be happy to help you and supply you all the information and both options in one place. Clean, quiet and environment friendly our electric forks will answer your special needs. Or perhaps IF you need heavy load machinery you will be more interested in our impressive diesel forklifts? Electric forklift are well known for their quiet and clean performance, they work on electric engine with rechargeable batteries. They do not emit green house gases or other toxic gas, therefore they are highly suitable for use indoors. Even though they have a lower capacity than diesel forklift, they are in demand due to their quick and easy to maneuver inside narrow aisles in the warehouse. For tough jobs Diesel forklift is recommended, it can easily handle any work done outdoors and even under special environmental conditions. Their capacity is usually evaluated by the lift capacity but this is not their only strength. Diesel forklift is powered by fuel and can work hours in the outdoors without the need for electric outlet. Industries in need for power and strength will always choose the diesel forklift. If you find it difficult to decide between electric forklift to a diesel forklift we will always be happy to help you evaluate your needs and recommend the best option for your business. We supply forklift equipment, including various replaceable parts and accessories for your forklift needs. From security aspects to innovative products that will grant your forklift with additional abilities. We offer a variety of accessories to your forklift that gives additional value and will stretch up the usage of the forklift in your business activity. Among them you can find a variety of forklift attachments as - Rotating Fork Positioner, clamps and many more. When looking for forklift equipment it's important to pay attention for the service. When there is a failure in your equipment we understand how much it's important to you to fix it as fast as possible. Our forklift equipment includes replaceable stock for fast repair service.